AAA has concluded a study it thinks answers the question. But do American's even know the actual cost of gasoline? Do you? At what point do you consider gas prices too high? AAA has done a consumer study and it thinks it knows how most Americans would answer that question. According to its survey fully half of drivers think that gas prices are “Too High” when the price at the pump reaches $3.44 per gallon. The price at which ninety percent of number of Americans that think gas prices are too high is not much higher. Interestingly, most Americans don’t really know what the cost of gasoline (or diesel) is in the US. They think they do, but actually, they are including the local and federal gasoline taxes in their “price at the pump.” Only gasoline has this odd departure for the way we as a nation think of the cost of a product. When one buys a car there is no federal tax. When one buys a house there is no federal tax. When one buys a gallon of milk at the store there is no federal tax. Interestingly, milk costs more than gasoline and there is no expiration date on the cows’ output. Only with gasoline and diesel is there a federal tax and local tax, and only with fuel prices do Americans mentally include the tax in the price. So if the price at the pump is advertised as $3.44 per gallon how much is the cost of the product itself? First of all, gasoline and diesel also have a unique price structure in that they always include “and 9/10s of a cent.” So when you see the huge $3.44 it really means $3.45. Most of us are savvy to that gimmick now. However, very few American realize that a gallon of gas costing them $3.44 at the pump in say, California, actually only costs $2.87. That is because there is a $0.184 federal gasoline tax plus a total of $0.38 tax levied by California on that gallon. Yet, Americans don’t think of gasoline as costing $ 2.87 when they fill-up. Of course they don’t, because from their pockets goes the gas cost and also the tax in one combined bill. 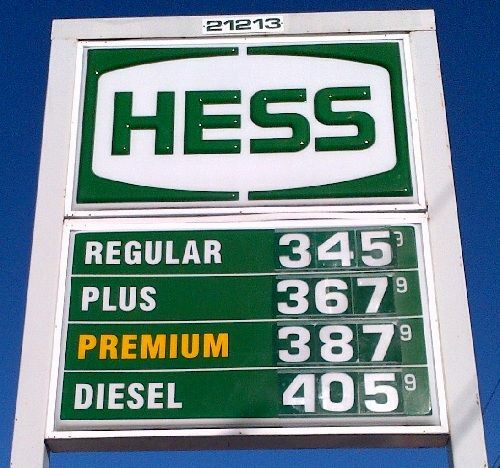 In California when gasoline costs $3.44 the percentage of federal tax added is 6.4% and the state tax added is 13.2%. In total, the tax on a gallon of gas is about 20 percent. It is actually higher on Diesel fuel, which is becoming all the rage lately. For a comparison of gasoline vs diesel cars click here. On reason this trick works so well is that there is no other consumer product, which nearly all Americans must use, for which the federal government institutes a tax. When we buy and iPAD for $500 there is not another $32.00 in federal tax added. If we buy a house for $500,000.00, the US government does not add another $32,000.00 to the cost. Looking back to the AAA study, 90% of Americans think gasoline prices “Are too high” when the price reaches $4.00 per gallon. There is no doubt that the total miles driven by Americans has going down since about 2005. In 2008 when the economy hit a very tough spot the drop was the most dramatic. Clearly, the cost of gasoline plays a role. However, there is no “average American” and almost all studies point out that younger people are driving much less than in prior years, with many opting not to even get their license by comparison to earlier generations. There is no single cause for this. Some point to changing habits and the ability to be social using smart phones, tablets, and interactive games like X-Box Live, as ways younger people now socialize, as opposed to cruising around in gas guzzlers on a Friday night. Commenting on this Robert L. Darbelnet, President and CEO of AAA said in a statement about the study “"It is possible there is a new normal in terms of consumer attitudes now that gas prices have remained above $3 per gallon for more than two years. Most people have resigned themselves to paying higher gas prices and are cutting back on driving, shopping and dining out to save money." The “it is possible” part points out that Mr. Darbelnet does not actually know why there are fewer gasoline gallons purchased, which is then extrapolated to mean fewer miles driven. Many speculate that higher gasoline prices would spur a move to much more efficient vehicles. For a close look at that topic click here. It would be hard to know for sure what the main choices would be if Americans had to pay, say $5.00 per gallon for gasoline. In fact, we do know how Americans would react because Canada, which shares a border with the US, as well as a lifestyle, had gasoline prices for nearly a decade at that level, while in the US consumers paid about 35% less. What vehicles were the most popular in Canada for those years? The Ford F-150 pickup truck, other pickup trucks, and then mini-vans. Despite paying a price much higher than what 90% of Americans consider “too high” for gasoline, our closest possible consumer comparison made pretty much the same vehicle choices we did. Consumers reports about what they will do if prices go higher are telling. There seems to be a sharp disconnect between what people report they have done compared to what they actually have done. For example, it is easy to believe the AAA study’s report that 86% of American say they now drive less due to gas prices reaching $3.44 on average nation-wide. However, 33% say they now car-pool. Do one of every three people you know now car-pool to and from work? When you are in traffic during rush hour, is every third car occupied by two or more people? If so, you are in a very unique part of the country. AAA’s new study does shed some light on American’s opinions about gasoline prices, but many questions are still unanswered about American’s future driving habits.